He was born in Illinois in 1831, became a lawyer there in 1854, and answered the call of duty in 1861, soon coming under the command of a man who had raised a regiment from Illinois. That commander was Ulysses S. Grant, and the Illinois lawyer was John Aaron Rawlins. 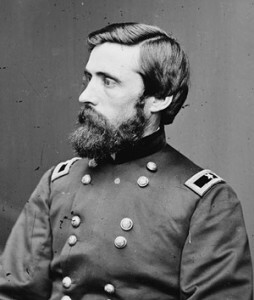 Rawlins served with Grant throughout the war, and was Chief of Staff of the Army of the Tennessee, Chief of Staff of the Military Division of the Mississippi, promoted quickly to Brigadier General, and ultimately served as Chief of Staff of the General Headquarters of the United States Army. He didn’t return to Illinois when the war ended, but stayed with Grant, becoming his Secretary of War when Grant took office as President in March of 1869. And an even better question: of what the heck use are Executive Orders to genealogists? For more recent Executive Orders, from 1945-1989, the National Archives has put online the Federal Register’s Codification of Presidential Proclamations and Executive Orders, and a more comprehensive overall collection is online at the American Presidency Project of the University of California at Santa Barbara. Its collection of Executive Orders begins with the Executive Orders of 1826 announcing the deaths of Thomas Jefferson and John Adams and runs through President Obama’s October 2012 Executive Order 13629 Establishing the White House Homeland Security Partnership Council. And you can read more about Executive Orders generally in Barbara Bavis’ Executive Orders: A Beginner’s Guide25 posted this week in one of The Legal Genealogist‘s favorite blogs, In Custodia Legis: Law Librarians of Congress. And take a look at the Executive Orders FAQ’s from the National Archives too. Presidential Executive Orders as genealogical resources. Who’d have thunk it? Image: Matthew Brady, 1865; Library of Congress, Prints and Photographs Division, Washington, D.C.
Wow! Who knew? A delicious batch of orders to stir… Thanks, Judy! Aren’t these just wonderful, Celia? Definitely fascinating records and frankly not what I would have expected. Wuz ya a history teacher in a prior life? That’s one heck of a history lesson. Thanks, Teach! Teacher, yes. History, no. But I love history — how else can we understand our families?